Here is part 2 of your rare double-header Monday Team Stryker update! I thought about moving this page to Wednesday but I really want to be able to give you guys the final page on Monday, the inks on Wednesday and the pencils on Friday. I would rather give you a double header today to help start your week off right. I will try my best to make sure Wednesday’s update comes in on time. As for today’s page this is page was a blast to color as I got to have a lot of fun having a big glowing green light in the middle of the table. I was trying to go for the hologram effect. Out of all the aspects of creating a comic, coloring and lettering are my two newest acquired skills so it is a lot of experimentation on my end to get things to look the way I want them to. I’m constantly looking at other comics and the cool kinds of special effects that go into them that I normally wouldn’t notice. You take for granted how good some comics look once they’ve been colored. A good colorist can make a bad page good and a good page great. 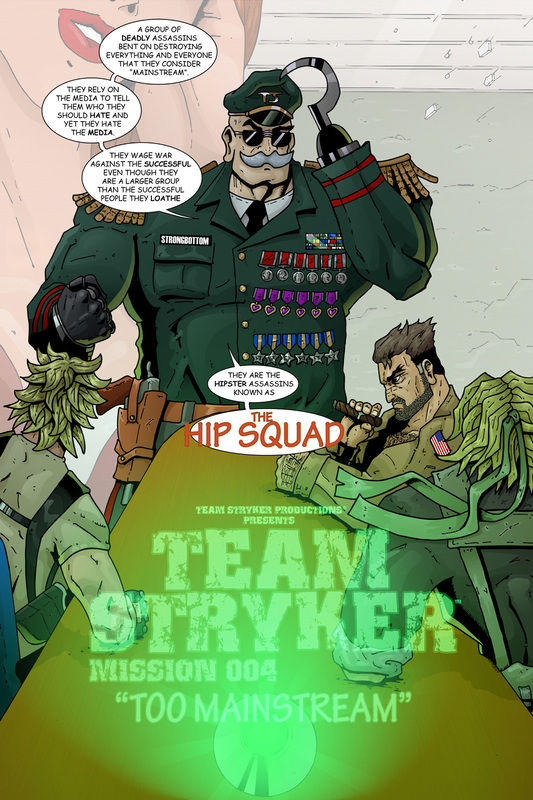 Hopefully you all agree that this page of Team Stryker lands somewhere in that category. Thank you to all of my amazing (and patient) supports who have stood by me in this time of transition. Be sure to check back on Wednesday for your behind-the-scenes look at Team Stryker Mission 004 Page 02!